On behalf of Chief Gus Sarigianopoulos and the Campbell Police Department, we would like to take the time to thank you for assisting us in putting together first aid kits for our cruisers, along with donating all the materials contained within them. We greatly appreciate all of the time and effort you have put into making this happen for us, the kits will undoubtedly help us better serve the community. 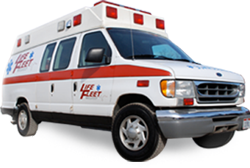 I am writing in regards to two of your young men that are EMTs and drive the ambulance for transporting patients to and from doctor’s appointments. The two gentlemen are Dennis Renz and John Cunnert. These two men went above and beyond the call of duty. My brother is in Greenbriar Healthcare Center and needs transported to doctor’s appointments each week. My brother is not a small man either. Dennis and John have transported him several times, and they made sure he was comfortable by adjusting and re-adjusting the gurney several times. They made sure that my brother was covered appropriately. They made sure he was not exposed to the world. These two men need to be recognized for their excellence in caring for patients and concern for their clients.